Bartholomaus created a record player that translates the different colors and textures of tree rings into music. 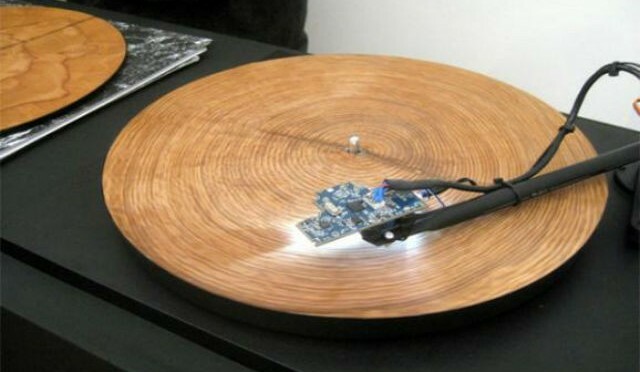 Rather than use a needle like a record, sensors gather information about the wood and turn them into piano notes. 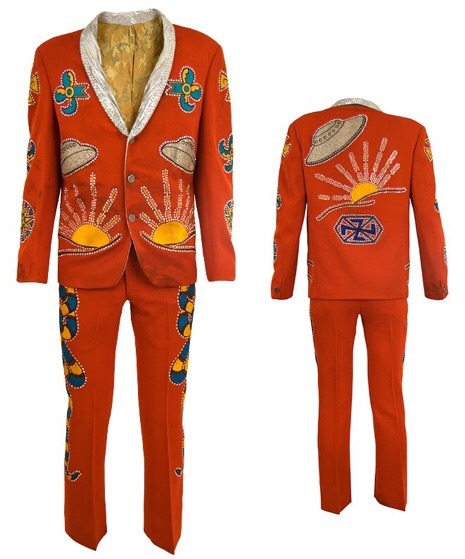 dye that has captured the human imagination for millennia. It is also about people who are reviving indigo in projects that are intended to improve life in their communities, preserve cultural integrity, improve the environment, and bring beauty to the world. 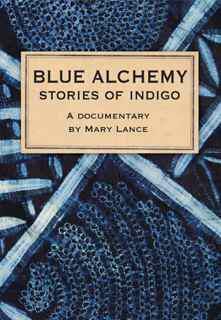 BLUE ALCHEMY was filmed in India, Japan, Bangladesh, Mexico, El Salvador, Nigeria, and the USA. 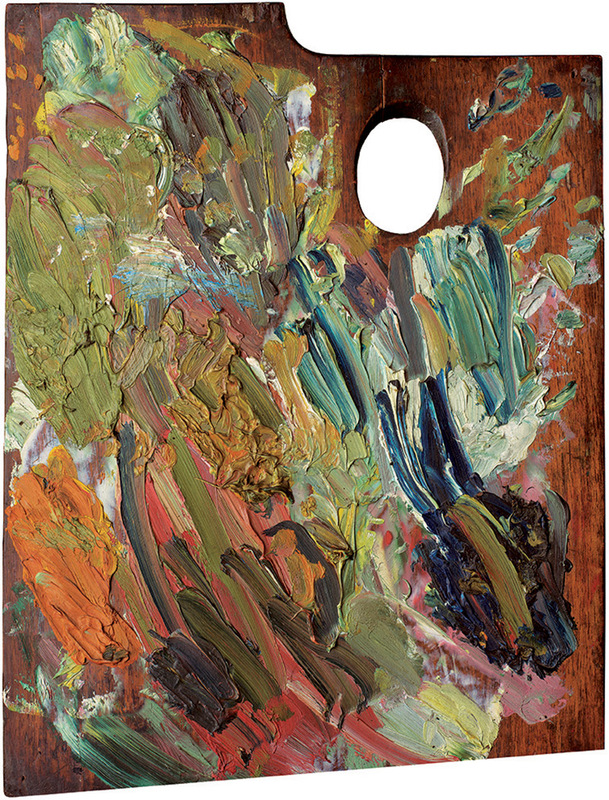 Photographic Portraits of Famous Artist’s Paint Palettes by Matthias Schaller. Since 2007 photographer Matthias Schaller has photographed raw, abstract paintings. 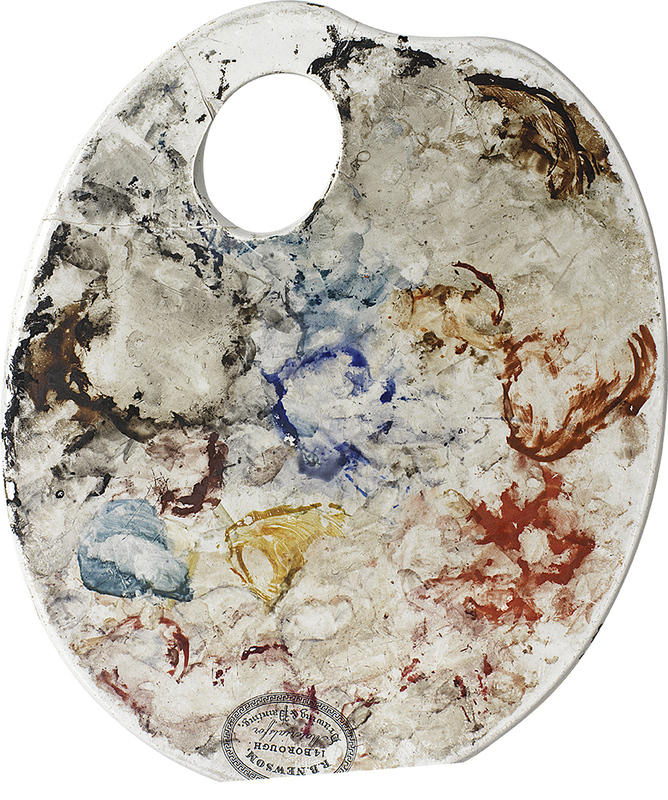 The paintings however are not found on canvas, but rather smeared onto the tools used to craft each work of art—the palettes. His series, Das Meisterstück (The Masterpiece), claims these behind-the-scene objects as portraits of the artist, while also giving a direct insight into the detailed techniques performed by each painter. “Shot Glasses for Gouache Paint holders Mounted on Plywood”, MAURO MALANG SANTOS (b.1928), Undated, Collection of the Artist. After mixing his peculiarly saturated colors, Malang found shot glasses as ideal containers in which to dip his brush before applying paint on his canvasses. He used a wooden base especially fabricated to hold the shot glasses in place. We spent few weeks in Manila this winter, immersing in the Filipino culture, shooting colors and hunting words for our ColorCorpus research. It was good fun and we’ll be back to visit the countryside at some point later. Enjoy! 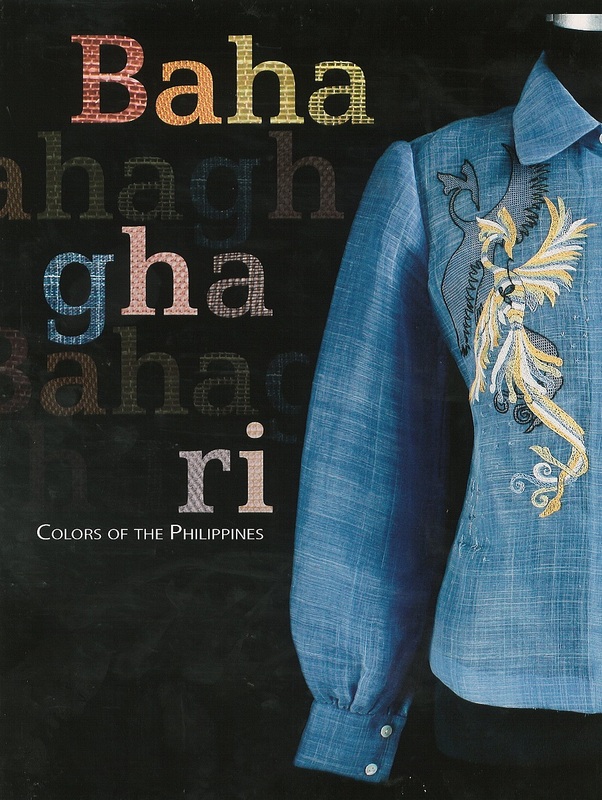 The Philippine Textile Research Institute of the Department of Science and Technology (PTRI-DOST) has recently released its new publication, Bahaghari: Colors of the Philippines. The 140-page book contains general information on natural dyes and their plant sources and clear, crisp photos of PTRI-developed naturally dyed tropical fabrics in formal ensemble with a twist of elegance worn by participants and delegates to the 8th ASEAN Science and Technology Week (ASTW) in July 2008, Miss Earth 2007 candidates, and some ramp models. Besides the ASTW, the naturally dyed barongs and dresses jazzed up the Bahaghari Fashion Show at the ASTW dinner held at Hotel Sofitel Philippine Plaza, Manila and gave zest to the pictorial for the book. Bahaghari: Colors of the Philippines attaches social connotations with each featured color from natural dyes and illustrates the facets of the Filipino culture. 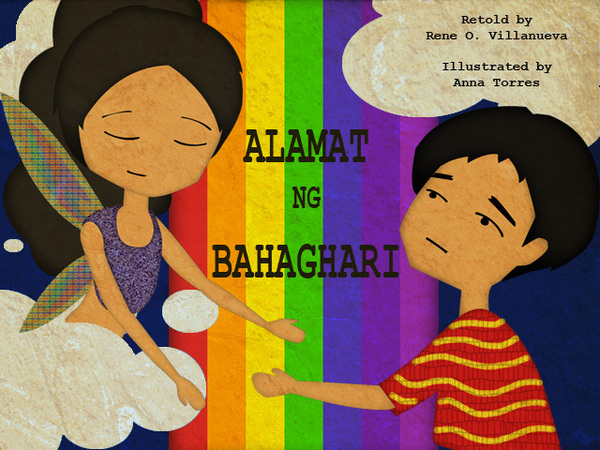 PTRI researchers Julius L. Leaño Jr. and Jenice P. Malabanan co-wrote the book. According to an old story, the early settlers of Pinamalayan came from Marinduque. While on their way to Mindoro using their boats, they encountered turbulent weather and lost their direction. They prayed to God Almighty for deliverance and guidance so the weather cleared and a rainbow appeared on the horizon. The crew shouted ipinamalay meaning “it was made known”. They followed the direction of the rainbow and landed at what is now Barangay Lumangbayan and established the first settlement which they named Pinamalayan. The rainbow became the historical landmark of the town. The yearly Bahaghari Festival is a colorful commemoration of the importance of the rainbow in the history of the town of Pinamalayan. The celebration includes a street dancing competition, cultural presentations, religious and cultural activities, products and trade fair. Like the rainbow which rises to give color in the sky after the torrent of rain, the Bahaghari Festival is a reflection of the continuing effort of the people of Pinalamayan that there is truly paradise at the end of the rainbow. Philippine indigo (Indigofera tinctoria) is one of the oldest dyes in civilization and one of the most widely used natural dyes in the whole world due to its excellent colorfastness properties. In the Philippines, indigo was once extensively used in the weaving industry including the abel of llocos and the Abrenian fabrics. 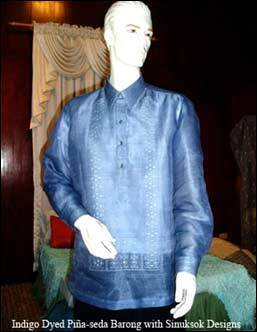 The Philippine indigo has been part of the Galleon and Chinese trade in northern Philippines, centuries ago; however, the successful production of cheaper synthetic indigo eased it out of the market and caused its rapid decline not only in the Philippines but also all over the world. In the Philippines, the former First Lady Amelia “Ming” Ramos initiated the effort to revive indigo dyeing. She became the Patroness of natural dyes and spearheaded the Katutubong Kulay Project of the Katutubong Filipino Foundation in the early 1990’s. The transfer and commercialization of the Philippine Textile Research Institute (PTRI) developed technology on indigo in Abra revived and upgraded the age long tradition of using tayum, the local name of indigo in Abra. In fact, a town in Abra was aptly named Tayum, reportedly because of the abundance of naturally growing indigo in the place. Tayum is where Abra’s Natural Dye Center is located. When the Harvard Art Museums reopen this Sunday after a six-year expansion project, historic pigments foundational to the field of art conservation in the United States will be on public view. 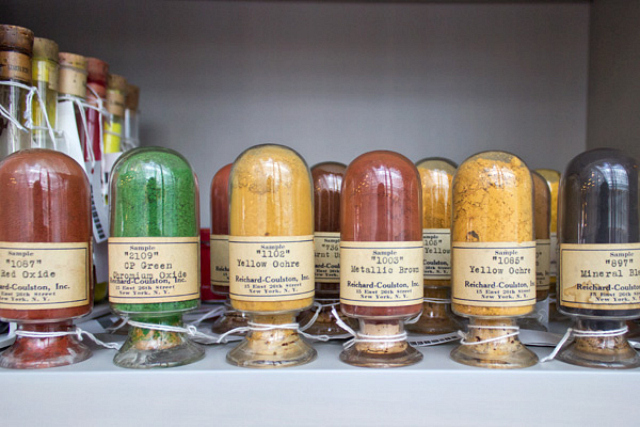 A new display will showcase the Forbes Pigment Collection as part of the Straus Center for Conservation and Technical Studies. A friend sent this article from Business Insider. One perhaps should inform these people that the term “κυανός” /kianos/ i.e. “cyan” (you know CYAN as in CMYK??) is an Ancient Greek word, originally meaning “dark blue” (in Modern Greek is “light blue”). Ancient Greeks also used the term “γλαυκός” /γlafkós/ meaning pale blue, mainly sky or sea blue, the color “γlafkó”. It’s true, we haven’t re-read the Odyssey since we were in high-school (we can go through it any time though if need be), and we haven’t meticulously counted all the color terms in it, but still, the fact that Homer, a poet, used the description mentioned in the article (“sea as dark wine”) in Odyssey, doesn’t really mean that people back then couldn’t perceive the blue color; and Homer was blind anyway. But Homer was a poet, and poets, you know, are free to describe things anyway they wish, that’s what poets are for! Rationalism kills poetry and art and it’s such a poor approach. If one counted on fauvist painters to tell them about the natural world, what would one say then about their black skies, blue suns, purple tree trunks etc? Also, just because a 1858’s UK scholar counted 200 blacks and 150 whites in Odyssey it doesn’t mean Ancient Greeks “lived in murky and muddy world, devoid of color, mostly black and white and metallic, with occasional flashes of red or yellow”, and it certainly doesn’t make Gladstone an authority to say ancient Greeks lacked color terms for blue. Last, one should add that the term “sky blue” is one of the most fundamental in many (ancient) languages, for the SKY was (and is) so important to so many (the ancient/tribal) people! κυανός -ή -ό [kianós] : (λόγ.) γαλάζιος. || (ως ουσ.) το κυανό, το κυανό χρώμα. γλαυκός -ή -ό [γlafkós] : ανοιχτός γαλάζιος, απόχρωση κυρίως του ουρανού ή της θάλασσας. || (ως ουσ.) το γλαυκό, το γλαυκό χρώμα.